FlashLock is designed to put access control in the palm of your hand. Using serial optical communications technology combined with a web-enabled device, issue and receive access to any lock retrofitted with FlashLock. Simply open a FlashLock access link and hold the screen to the face of the lock. Open FlashLock using a cell phone or tablet. Open FlashLock using an infrared key fob. Send and receive duration limited access via text or email. Once users access the link, the screen of the hand-held device will flash. Users simply hold the phone up to the FlashLock face. 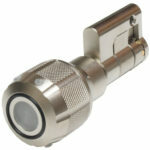 If used during their assigned access schedule the lock will flash and the knob can be turned. If used outside of their access schedule the flashing screen will not open the lock. FlashLock eliminates the need to worry about lost or stolen keys, copied keys and more! 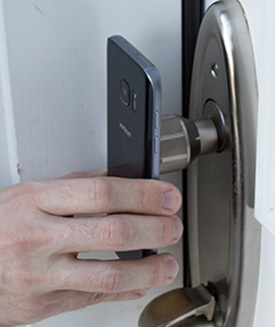 With FlashLock, your cellular device is your key. For everyday use, FlashLock can also be opened using a simple and compact FlashLock fob. In order to adjust or remove permissions, a user-friendly, web-based interface allows customers to make changes at any time. Additionally, FlashLock can be integrated into a larger CyberLock system using CyberAudit Web 9.0. 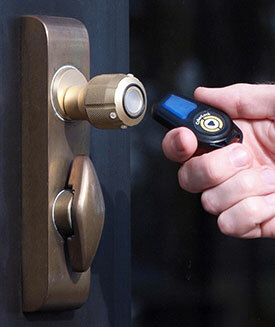 This allows users to integrate CyberLock cylinders and smart keys with FlashLock and FlashLock fobs. Applications for FlashLock are limitless! It is an ideal solution for residential or vacation homes, college dorms, apartments, hotels, churches, and more. FlashLock allows owners of residential facilities to control who enters what space at what time. As with all CyberLock products, FlashLock is made in the USA.